Stick Skills, (the ability to throw and catch equally well with BOTH the left and right hand) are incredibly important for all lacrosse players. Unfortunately, there are no shortcuts to lacrosse stick skill proficiency. Wall Ball is a practice technique used by many of today's top players to develop their stick skills. Every good lax player has spent time on the wall. The best have spent the most. In an effort to encourage our own Longhorn Youth Lacrosse players to improve their individual stick skills, we are proud to introduce the Longhorn Wall Ball Wrangler program. 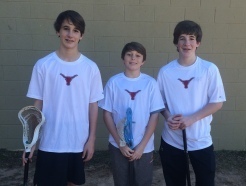 The Longhorn Wall Ball Wrangler program provides every Longhorn Youth Lacrosse player with the opportunity to earn the coveted Wall Ball Wrangler shooter shirt. Boys in each age group, from U9 to U15, (including the Junior Longhorn players) can earn the Wall Ball Wrangler shooter shirt by completing the Wall Ball Wrangler test for their specific age group. The Wall Ball Wrangler test requires each player to demonstrate their ability to throw and catch the ball using a number of different throwing and catching techniques. Earning the Wall Ball Wrangler shooter shirt is not an easy task. It will require dedication and hard work, on the wall, outside of regular practices and games. In fact, it is very unlikely any player will be able to step up and complete the two minute stick skill test without having first spent a considerable amount of time on the wall. The following recommendations will help your son avoid hours of frustration and significantly improve his chances of earning the coveted Wall Ball Wrangler shooter shirt. It is easy to spot players that practice by taking the test over and over and over again as they typically get through the first or second skill easily, but then struggle in the later skills. They also grow tired and get frustrated easily. Please encourage your players to work on the recommended Wall Ball Drills found in this section of the website until they are able to comfortably complete each workout within a 20 to 30 minute time frame. At that point, they will be ready to earn their shirt. Please review the following pages to learn more about PROPER wall ball fundamentals, the recommended wall ball practice drills for each age group and details regarding the Wall Ball Wrangler test for each age group.